Map of the Rio Grande Watershed. 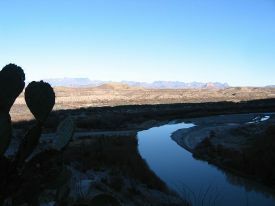 Known as the Rio Grande in the United States and as the Río Bravo (and more formally as Río Bravo del Norte) in Mexico. The river flows generally southward for 1,885 miles (3,034 km). It is the fourth longest river system in the United States and the fifth longest in North America. Worldwide, it is registered as the 20th longest. The river rises as a snowfall fed mountain stream 3,900 m (12,800 ft) above sea level in Colorado's San Juan Mountains, in the Rocky Mountain range. Originating in a cold steppe climate, it descends through the Southwestern United States desert before watering rich agricultural regions near its mouth at the Gulf of Mexico. The Rio Grande serves as a major part of the international border between the United States and Mexico dividing 1,254 miles (2,018 km) of the 1,950 miles (3,138 km) border. The boundary follows the middle of the Rio Grande, according to the 1848 Treaty of Guadalupe Hidalgo, "along the deepest channel" from its mouth on the Gulf of Mexico to a point just upstream of El Paso and Ciudad Juárez. Cities of the Rio Grande include Albuquerque, New Mexico, and the Texas cities of El Paso, Laredo, and Brownsville. Juarez is the most prominent city on the Mexican side of the river. A 191.2 miles (308 km) segment of the Rio Grande was designated a Wild and Scenic River in 1978. This stretch begins in Big Bend National Park, continues through isolated, rugged canyons and the Chihuahuan Desert, and flows through some of the most critical wildlife habitat in the country. In 1997, the entire river was designated an American Heritage River. These designations offer protection to the river's environment and natural resources. Río Grande is Spanish for "Big River" and Río Grande del Norte means "Great River of the North." Because "río" means "river" in Spanish, the phrase "Rio Grande River" is redundant. In Mexico the river is known as Río Bravo or Río Bravo del Norte, "bravo" meaning "fierce" or "brave." 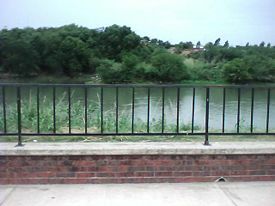 There is a city along its banks that bears its name (Río Bravo, Tamaulipas) located 10 miles east of Reynosa, Tamaulipas, and directly across from the Texas city of Donna. Rio del Norte was the most common name for the Upper Rio Grande (roughly, within the present-day borders of New Mexico) from Spanish colonial times to the end of the Mexican period in the mid-nineteenth century. Its use was first documented in 1582. The use of the modern English name Rio Grande began with the early American settlers in south Texas. By the late nineteenth century, the name Rio Grande for the entire river, from [Colorado] to the sea, had become standard in the United States. Rio Bravo had become the standard Spanish name for the lower river, below its confluence with the Rio Conchos, by 1602. The Rio Grande rises in the east Rio Grande National Forest in the U.S. state of Colorado. 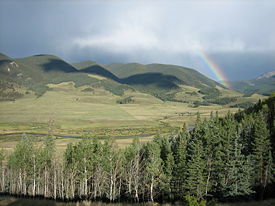 It is formed by the joining of several streams at the base of Canby Mountain, just east of the continental divide. From there, it flows through the San Luis Valley, then forms the Rio Grande Gorge and White Rock Canyon of northern New Mexico. 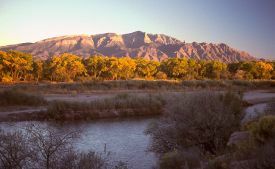 In New Mexico, the river flows through the Rio Grande Rift from one sediment-filled basin to another, cutting canyons between the basins and supporting a fragile bosque ecosystem in its floodplain. It flows through the cities of Albuquerque and Las Cruces then into Texas. It is in this stretch that the transition from a cold steppe climate with a vegetation of juniper, piñon pine, and sagebrush to a hot steppe and desert climate characterized by cactus, creosote bush, mesquite, yucca, and other desert flora occurs. At the city of El Paso it begins to form the border between the United States and Mexico. Here the river cuts three canyons between 1,500 and 1,700 feet in depth across the faulted area occupied by the “big bend,” where the Texas side of the river comprises the Big Bend National Park. From El Paso eastward the river flows sluggishly through desert and into a fertile delta where it empties into the Gulf of Mexico. Only in the sub-tropical lower Rio Grande Valley is there extensive irrigated agriculture. A major tributary, the Río Conchos, enters at Ojinaga, Chihuahua, below El Paso, and supplies most of the water in the 1,254 miles (2,018 km) Texas border segment. Other known tributaries include the Pecos and the smaller Devils Rivers, which join the Rio Grande on the site of Amistad Dam. The Chama and Puerco Rivers are additional U.S. tributaries, and the Salado and San Juan Rivers flow into the Rio Bravo in Mexico. The Rio Grande's watershed includes 336,000 square miles (870,000 square km). Because much of the basin is arid or semiarid, only about 176,000 sq mi actually contributes to the river’s flow. The Rio Grande at Bernalillo, New Mexico, with the Sandia Mountains. A European expedition to the Gulf of Mexico coast occurred in 1519, and while it is believed they must have seen the Rio Grande, the maps created on that trip showed only nameless indentations to mark the mouths of rivers. The first time the name Río Bravo appeared was on a 1536 map compiled by a royal Spanish cartographer. Around the same time, the shipwrecked Álvar Núñez Cabeza de Vaca and three companions crossed the Rio Grande. While it is certain they crossed the Rio, the vagueness of Vaca’s records makes it impossible to pinpoint where the crossing occurred. Francisco Vásquez de Coronado led an expedition in 1540 to find the rumored rich cities to the north of Mexico, which brought him to the Pecos River area in modern-day New Mexico, where he discovered various Pueblo Indian communities. In-depth exploration of the Rio Grande basin did not occur until just prior to mining and agricultural settlements of the late sixteenth to the eighteenth centuries. The earliest settlements began in 1563 in what is now the Mexican state of Chihuahua. These were followed by settlements in the upper Rio Grande area in 1598 (now New Mexico), and finally in 1749 along the lower Rio Grande. Juan Bautista de Anza explored the Rio Grande into the San Luis Valley, not far from its source. However, this 1779 expedition's maps and papers have remained unpublished in the various archives of the Spanish government. Because of this, historians have tended to reference the later expeditions of Zebulon Pike in 1807 and John C. Frémont in 1848–1849 in the upper Rio Grande area. Careful scientific study of the river commenced only in 1853 when a joint international boundary commission began its fieldwork. Both Mexican and American surveyors took part in this work. The international border between the United States and Mexico extends for 3,138 km (1,950 miles). Of this, 1,254 miles (2,018 km) follows the middle of the Rio Grande—according to the 1848 Treaty of Guadalupe Hidalgo between the two nations, "along the deepest channel"—from its mouth on the Gulf of Mexico to a point just upstream of El Paso and Ciudad Juárez. With the exception of a small number of minor border disputes, since settled, the current course of the border was finalized by the Treaty of Guadalupe Hidalgo and the 1853 Gadsden Purchase. An earlier agreement signed during the Mexican War of Independence by the United States and Imperial Spain, was the 1819 Adams-Onís Treaty, which defined the border between the republic and the colonial empire following the Louisiana Purchase of 1804. Whether the border between Mexico and the breakaway Republic of Texas followed the Rio Grande or the Nueces River further north was an issue never settled during the existence of that Republic, and the uncertainty was one of the direct causes of the 1846−1848 Mexican–American War. The Country Club Dispute was a dispute between Texas and New Mexico. The U.S. Supreme Court ended this dispute in 1927. The Chamizal was a disputed parcel of land between El Paso, Texas, and Ciudad Juárez, Chihuahua. This dispute was resolved by treaty in 1963. The Ojinaga Cut was a disputed parcel of land between Presidio, Texas, and Ojinaga, Chihuahua. This dispute was resolved by treaty in 1970. The Horcon Tract was a parcel of land that included the city of Rio Rico, Texas, which was accidentally placed under Mexican administration because of an irrigation change. This issue, which was technically not a dispute since both sides were in agreement about its legal status, was resolved by treaty ceding the land to Mexico in 1970, but the official handover did not take place until 1977. The major international border crossings along the river are Ciudad Juárez—El Paso; Presidio, Texas—Ojinaga, Chihuahua; Laredo, Texas—Nuevo Laredo, Tamaulipas; McAllen-Hidalgo, Texas—Reynosa, Tamaulipas; and Brownsville, Texas—Matamoros, Tamaulipas. Other notable border towns are the Texas/Coahuila pairings of Del Rio—Ciudad Acuña and Eagle Pass—Piedras Negras. The United States and Mexico share the waters of this river under a series of agreements administered by an international body formed in 1889, known as the International Boundary and Water Commission. It was created by the Convention of 1889, and given its present name under a 1944 Treaty. Under these agreements, the IBWC has a U.S. section and a Mexican section, headquartered in the adjoining cities of El Paso, Texas, and Ciudad Juárez, Chihuahua. The U.S. section is administered by the United States Department of State; the Mexican part by the Secretariat of Foreign Relations of Mexico. Its purpose is to administer the many boundary and water-rights treaties and agreements between the two nations. While Canada has long been recognized as the primary destination for fleeing slaves who used the Underground Railroad, the length and accessibility of this border made it another crossing point. Many enslaved blacks fled over the west Texas mountains and deserts and crossed the Rio Grande into Mexico, seeking haven in that nation's liberal colonization policies and abolitionist stance. The Rio Grande flowing in Big Bend National Park. A series of treaties between the U.S. and Mexico in 1905–1907 and 1944–1945. 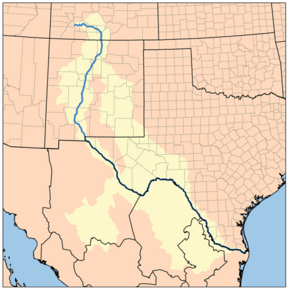 The Rio Grande Compact, an interstate pact signed in 1938 between Colorado, New Mexico and Texas, which regulates and apportions the waters of the subbasin above the site of former Fort Quitman, Texas. The Pecos River Compact of 1948 between New Mexico and Texas, applies to the Pecos River and its tributaries in West Texas (above Girvin). The quality of water entering Texas affects Texas users all the way to Amistad Reservoir on the Rio Grande. Typically all of the average annual production (more than three million acre-feet) in the upper Rio Grande is consumed within this subbasin, including the 60,000 acre-feet allotted by treaty to Mexico. There are stretches along the lower river which have at times had no surface flow. Its depth has varied from nearly 60 feet (18 m) to a bare trickle or nothing. This has led to a stretch of the river from Fort Quitman to Amistad Dam being nicknamed the "Forgotten River." Early accounts of the river present it as being "wide" and "copious," with backwater sloughs replenished by periodic floods. In recent years this stretch of river has periodically dwindled to a trickle of salty water. In April 2003, the river dried up through Big Bend National Park's Mariscal Canyon. This is due to both agricultural irrigation and the effects of an invasive species, the saltcedar, which consumes thousands of acre-feet of water. In the summer of 2001 a 330 feet (100 m) wide sandbar formed at the mouth of the river, marking the first time in recorded history that the Rio Grande failed to empty into the Gulf of Mexico. The sandbar was subsequently dredged, but it re-formed almost immediately. Spring rains the following year flushed the re-formed sandbar out to sea, but it returned in the summer of 2002. The river once again reaches the Gulf, but ecologists caution that strict water conservation measures must be adopted by communities along the river in order to preserve the Rio Grande. ↑ J.C. Kammerer. May 1990. Largest Rivers in the United States United States Geological Survey. Retrieved January 19, 2009. ↑ Aaron Mahr Yáñez, 1998, The UGRR on the Rio Grande, Cultural Resource Management. Retrieved January 20, 2009. ↑ Environmental Defense Fund, August 22, 2003, The Forgotten River: The Struggle to Revive a Once Bountiful Oasis. Retrieved January 20, 2009. Horgan, Paul. 1954. Great River: The Rio Grande in North American History. New York: Rinehart. OCLC 597404. Kearney, Milo, Anthony K. Knopp, and Antonio Zavaleta. 2006. Further Studies in Rio Grande Valley History. UTB/TSC regional history series, v. 7. Brownsville, TX: University of Texas at Brownsville and Texas Southmost College. OCLC 71280470. Riley, Carroll L. 1995. Rio del Norte: People of the Upper Rio Grande From Earliest Times to the Pueblo Revolt. Salt Lake City: Univ. of Utah Press. ISBN 0874804965. This page was last modified on 13 July 2015, at 21:59.